Following the widespread report that the Prime Minister of the United Kingdom called Nigeria and Afghanistan fantastically corrupt countries, President Buhari has reacted. 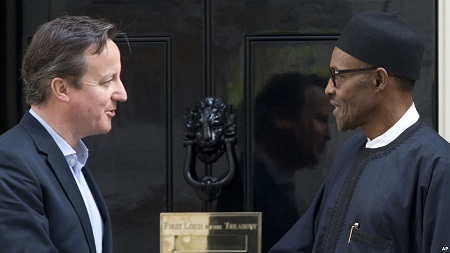 In a swift reaction to the statement credited to the UK Prime Minister, David Cameron, describing Nigeria as a “fantastically corrupt” country, the Nigerian Presidency on Tuesday said it found it “embarrassing”. According to Premium Times, the presidency reacted through a statement sent by President Muhammadu Buhari’s Senior Special Assistant on Media, Garba Shehu, shortly after the news of the Prime Minister’s comment went viral on the Internet. The statement, however, welcomed the remarks by the Archbishop of Canterbury, Justin Welby, who said President Buhari was not corrupt. “Thank you to the Archbishop. We have great admiration for the good relationship between our two countries,” the presidency said. Mr. Cameron was caught on camera ridiculing Nigeria as a “fantastically corrupt” country on Tuesday afternoon. In the short footage, published by British television station, ITV News, Mr. Cameron told the British monarch, Queen Elizabeth II, that Nigeria and Afghanistan are “two of the most corrupt countries in the world”. Mr. Cameron’s comment was published just as President Muhammadu Buhari departed Nigeria Tuesday to attend an anti-corruption summit organised by the UK government to be held in London on Thursday. Mr. Cameron was briefing the Queen on the notoriety of countries expected to attend the summit during an event at the Buckingham Palace to celebrate the monarch’s 90th birthday, ITV News reported.